Manage Clients module is a good platform present in OVIPanel which allows you to create individual accounts within purchased VPS servers hosting and can do, many tasks once created such as edit files, create email addresses, set up databases and lots more. It is also possible to do certain restrictions per account. For example, you can set one cPanel web hosting account to have a max of 5 email accounts, while another cPanel account can have a max of 10 email accounts. Creating Account is the initial step of hosting a website where you create a new account for your website along with passwords and log in to the particular account and configure your domain. If you have larger business and wish to have multiple cpanel accounts you can create here easily and quickly as per your server specifications, For Example: If you have purchased RAM of 2GB and Storage of 40GB cloud web hosting account creating Number of accounts is based on this specifications, Check the server disk space and Ram Usage before you create new accounts reason is if disk space, as well as RAM, get filled up it causes website downtime.If you find RAM or Disk space gets filled up kindly free up your memory by deleting unwanted junk files or you can upgrade your package so that you can prevent your site from downtime. Step1: Enter your Domain Name and just click on Username textbox, automatically username gets created and you can change username as per your requirement also Password will be auto-generated if you want to change password as per your wish you can create by clicking on Generate Password or you can type password which should consist of at least one uppercase, lowercase, number and special character and maintain 9 digits of password. Step2: Select the Package from a dropdown menu and enter your email address and click on Create. 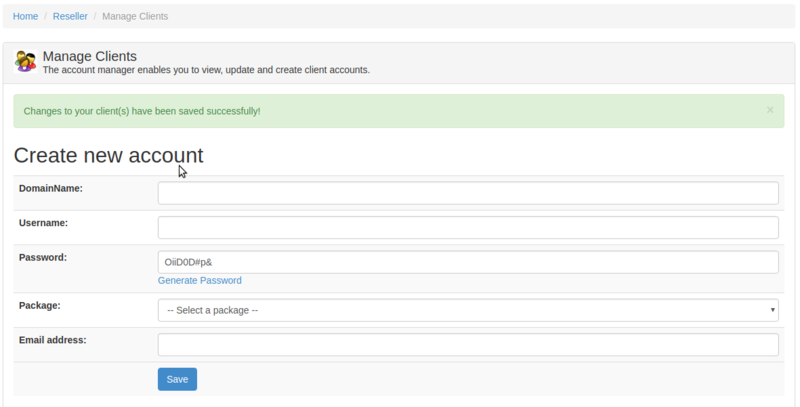 Step3: Once you created your account you can go to List Accounts Module to view the account details.